Is it still news that the TSA's pointless policies hassle Americans from cradle to grave? It is as far as I'm concerned. See, e.g., "TSA Says Baby-Frisking Justified" (May 12, 2011); "TSA: Terrorizing Seniors in America" (Apr. 24, 2012). And will be until they quit, most likely. But when the senior citizen in question is former Secretary of State Henry Kissinger, that's definitely news. 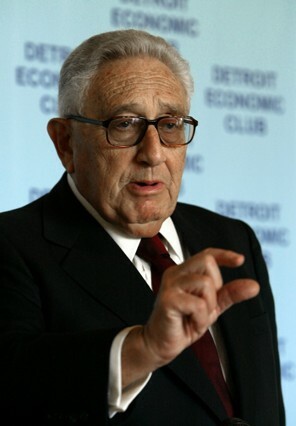 The Washington Post reported on Monday (via freelance reporter Matthew Cole) that Kissinger got special treatment at LaGuardia Airport in New York last week, though in this case "special treatment" meant a pat-down. This was apparently not done as part of a demonstration that all travelers are treated equally, which they're not, because Cole said that nobody appeared even to recognize Kissinger, a rather famous American and one of the few Nobel Peace Prize winners who might rival Obama for the top of the not-deserving-it list. Rather, the pat-down was apparently because Kissinger was an elderly person (he's almost 89) in an unscannable wheelchair, and thus clearly a potential terror threat. I mean, the guy's been involved in plenty of bombings, but that was a while ago. He must have passed (the screening, I mean, not away), because Cole, who was apparently on the same flight, also reported that Kissinger cracked wise on the airplane after being told that the in-flight meal was ham and eggs. "But do they have any schnitzel?" he said to an associate. That seemed to be an inside joke, Cole surmised, "since the aide and Kissinger both laughed." I couldn't find any historical reference suggesting this was something Kissinger has said in the past, although I'm guessing it was something he just threw out there at the Paris Peace Talks. If so, not much came of it, but it was worth a try.